(East Boston, January 22, 2016) Registered Democrats in East Boston will be holding a caucus at the Mario Umana Academy on February 27, 2016 at 10:00am to elect eighteen (18) delegates and three (3) alternates to the 2016 Massachusetts Democratic Convention, where Democrats from across Massachusetts will gather to adopt a new Action Agenda. The Convention will be held on Saturday, June 4th at the Tsongas Arena in Lowell. The caucus is open to all registered Democrats in East Boston, and the Democratic Committee welcomes participants. Delegates will be divided equally between men and women, and all ballots will be written and secret. In the spirit of inclusion, youth, minorities, and people with disabilities who are not elected as delegates or alternates may apply to be “add-on” delegates. For more information on the caucus or the committee please contact Michael Sulprizio at msulprizio@comcast.net / 617-438-0952. Boston, MA – Boston State Senator Linda Dorcena Forry today endorsed Democrat Diana Hwang for State Senate. Hwang, a local non-profit founder and former State House staffer, is a candidate to replace Anthony Petruccelli in the Democratic primary special election for Massachusetts’ First Suffolk and Middlesex State Senate District. Forry, the State Senator from the neighboring First Suffolk District, has served in the state legislature since 2005 and has been a trail-blazer in Massachusetts, breaking political barriers and building bridges across many of Boston’s diverse communities. The daughter of Taiwanese immigrants, Diana Hwang is the founder of the Asian-American Women’s Political Initiative – the country’s first political leadership organization for young Asian-American women. She previously served as a legislative aide in the State House and a Chief of Staff in the Boston City Council. Diana serves as Board member of the UMass Center for Women in Politics, served as co-chair of the Boston Women’s Fund and is a founding member of Mayor Walsh’s Women’s Commission. Diana currently lives in East Boston and previously lived in Revere. 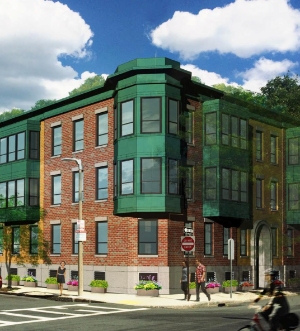 The proposed project at 202 Maverick Street is a 22,700 gross square foot, 3 story-plus penthouse structure with 23 residential units and 20 parking spaces on 8,050 square feet of land. Location: Logan Rental Car Center, 1st floor, Noddle Island Community Room, 15 Transportation Way, East Boston, MA 02128 DRIVING: Free event parking available in front of the building and in the Porter Street parking lot adjacent to the building. WALKING: Situated at the end of Porter Street, just a 4-minute walk from the Embassy Suites Hotel. Boston, MA -- Diana Hwang, a resident of East Boston, founder of the Asian-American Women’s Political Initiative, and former State House staffer, announced her candidacy to replace Anthony Petruccelli in the Democratic primary special election for Massachusetts’ First Suffolk and Middlesex State Senate District. Ileana Cintron, an East Boston activist and member of the Massachusetts Democratic State Committee, has endorsed Diana Hwang in this race. Diana also announced today that her campaign raised over $50,000 in the last two weeks of 2015, an unusually strong showing for a first-time candidate. “Diana is one of our brightest and most committed young progressive leaders. She has almost 10 years’ experience advocating for women, immigrants, and working families and has done so across three very different sectors: state government, city government, and non-profits. And Diana has already shown her commitment to running a strong campaign by raising more than $50,000 during the last two weeks of December. She will have the resources needed to win an incredibly short special election,” said Former Massachusetts State Treasurer Steve Grossman, who will serve on Hwang’s finance committee. Diana began her career as the sole staff member to the late State Representative Debbie Blumer where she drafted and guided key legislative proposals on immigrants’ rights and affordable health care. After Rep. Blumer’s untimely death, Diana served as Executive Director for the Massachusetts Caucus of Women Legislators, where she promoted legislation on critical issues to women and families such as healthcare, domestic violence and public education. In 2008, seeing the lack of opportunities for Asian-American women in politics, Diana created the Asian-American Women’s Political Initiative (AAWPI). It was the country’s first leadership initiative specifically focused on getting Asian-American women into politics. Over the last 6 years, nearly 50 young women completed a State House fellowship and mentoring program. Most have gone on to work on political campaigns, in legislative offices, or in other politically active roles. The daughter of Taiwanese immigrants, Diana Hwang has also previously served as chief-of-staff to an At-Large Boston City Councilor. Outside of work, Diana has been a leading advocate for women in Massachusetts, serving as Board member of the Center for Women in Politics (UMass); as co-chair of the Boston Women’s Fund; and as a founding commissioner for Mayor Marty Walsh’s Women’s Commission. Diana currently lives in East Boston’s Orient Heights neighborhood and previously lived in Revere. State Senator Anthony Petruccelli announced last month that he would be leaving the State Senate to take a new job, setting up a special election on May 10. The Democratic primary will be held on Tuesday April 12. Massachusetts’ First Suffolk and Middlesex state senate district includes Revere, Winthrop and parts of Cambridge and Boston, including East Boston, Beacon Hill, North End, Chinatown, Bay Village, West End and Waterfront. The individuals receiving this year’s award are among those who have made significant contributions to the economic and cultural prosperity of East Boston. 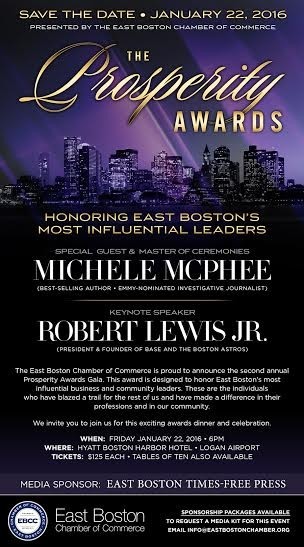 *And a secret recipient of the Selfless Dedication to the East Boston Community” Award!